Lee is growing 330 feet of Painted Mountain corn this year. He was about a month late planting it but we are hoping with the hotter than usual temps the corn will catch up. That’s a big field of corn! How do you store it–freeze, can, …? Painted Mountain corn is a genetically diverse Indian corn variety. Last time I let the ears dry in the field until just before the first big rain, then dried them further inside and shelled them. I stored them in ziplock bags. We’ve eaten a little bit of it as tortillas, but I need to get a mill so we can actually grind up the kernels more easily. I have around 200 feet of corn that is about the same maturity in the north part of the Willamette. Although ours is not as weed-free as yours! We also planted pretty late, I think around June 10th, so here’s hoping that the hot dry weather continues for a bit. It’s been loving the last few hot days. We planted this June 22, but there were some cool days and a bit of rain right afterwards and it dragged its feet at emerging. I just checked OSU’s heat unit calculator, and it reports that the weather this year puts us 6 days ahead of schedule vs. the 30 year average. Your corn should be ready for fresh market harvest on Sept 13th (based on June 10th start date). Ours won’t be ready until Sept 24th. That’s not very promising sounding (for us). Painted Mountain Corn is an interesting plant to grow. I’ve grown some “Indian Corn” (for lack of a better name) in the past that was similar to Painted Mountain, and found that if the different colors of kernels were sorted and planted it was possible to grow almost solid ears of whatever color I chose. You can plant a big block of blue corn (or red corn) and get all blue corn, mix your seeds at planting and get only the colors of kernels on an ear that you want (only red and white, etc. ), select for only the yellow or white corn, etc. 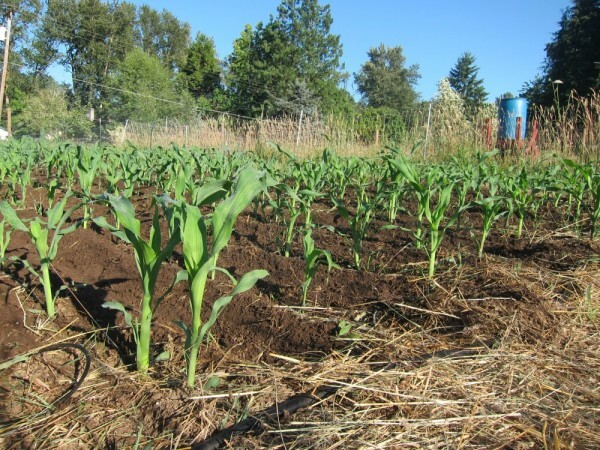 I was also able to plant two crops in one ideal growing season in a handful of years by picking the early maturing ears, replanting them as a double-crop, and then saving the seed from the early maturing ears from the double-cropped planting. That’s probably possible with any saved seed, and I just complicated everything with my trying to select for earlier maturing ears. That’s a pretty interesting result from selecting for kernel color. I didn’t realize the color would carry forward so reliably. Sounds like a recipe for holiday corn … red, white & blue perhaps? Orange and black? We saved seed from our first Painted Mountain harvest. My goal was to encourage yield and maintain diversity, but perhaps I should add “early maturing” to my wish list as well. We certainly don’t have enough heat here to grow two crops sequentially. We divided our little plot up into 6 quadrants and then picked the 3 or 4 longest ears in each quadrant, after excluding anything which had lodged or done weird things. (Painted Mountain is so diverse that it will do odd things like grow bare ears of corn among the tassels.) The quadrants idea is to avoid picking all your ears from a area which just happens to be better fertilized rather than genetically superior. Later we omitted any ears which duplicated the color schemes of others. I had read that if you don’t intentionally keep all colors in this variety, it will naturally favor the dark tones. So far I’ve been buying new seed and mixing it into my saved seed for any varieties I save. Eventually, I hope to save enough to just propagate my own variety indefinitely.